We have been working with the geopaparazzi mobile app. This is a very interesting app with a lot of capabilities, but setting it up is a pretty daunting prospect for a casual user. The first order of business is to make the download/upload of maps and user data easier. 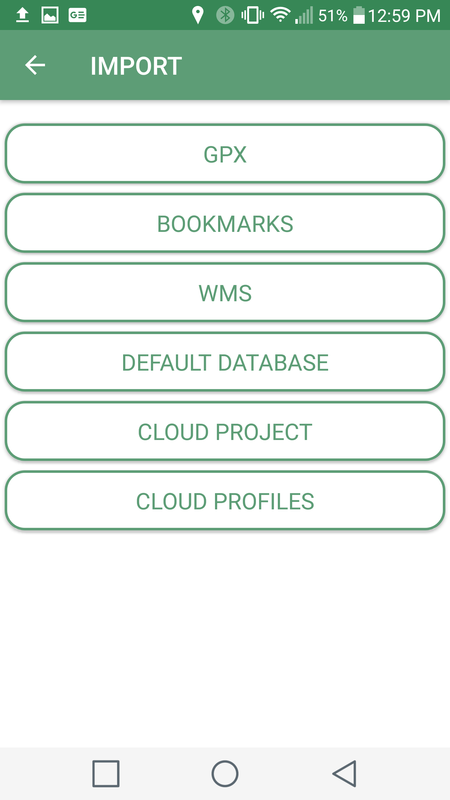 This is done using ‘cloud profiles’ which collect all the basemap, spatialite DBs, forms and other requirements into a listing served as a JSON stream that references the download links. This approach can be satisfied with hand assembled files hosted on a cloud service, the details are described in the user manual. To do anything more complex on the server side will require some infrastructure, including a database and scripting environment. To make it easier for prospective developers to get a server set up with a minimum of effort without sacrificing security concerns, I have created a cookiecutter recipe to quickly stand up a server for testing or production using some of the best open source code. This will take a while and will download a bunch of docker stuff. When the build is finished, fire up the local service and run the tests. Here is the reference to all the docker-compose commands. The important thing to remember in this case is that the -f parameter is necessary for all our commands in order to ensure that the docker network and associated containers are loaded correctly. So far, we have executed three of these commands. In the first instance (build), our containers were created and loaded with software and resources. 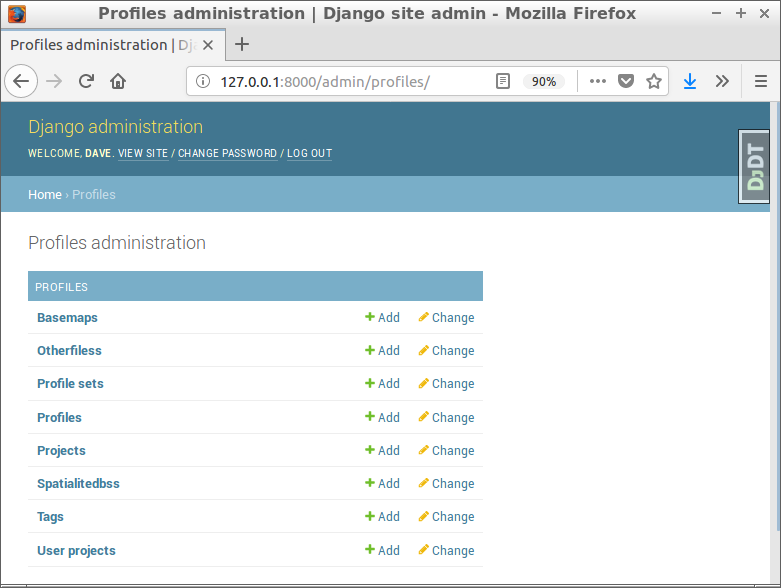 The next command (up) starts the whole thing, and as you can see you get a database container running PostGIS and another one running Django/python. If you leave off the -d option here, you will see all the startup messages for both containers but will need another console in order to interact with the system. The third command (run) starts up another Django/python container instance just to run the tests. The –rm option is included to ensure the container is removed when the tests are complete. This will save some disk space. Everything seems to be working? Now create a superuser. Now point your browser to http://127.0.0.1:8000 and you should see the default welcome page. 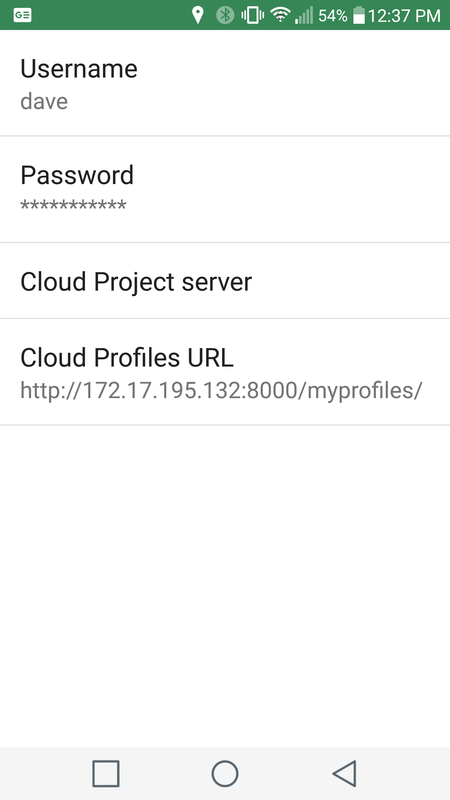 You can construct a profile through the admin interface at http://127.0.0.1:8000/admin, login as the superuser created above. 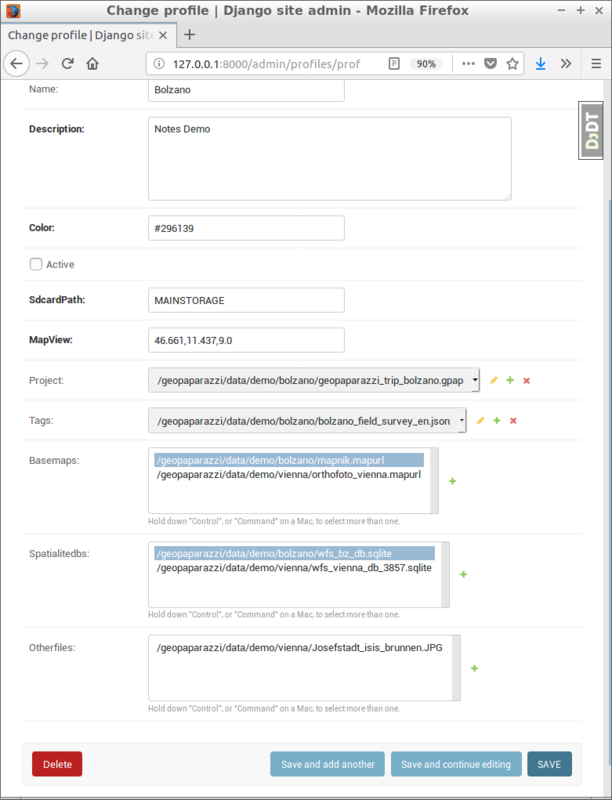 You need to select the appropriate Project, Tags, Basemaps, Spatialitedbs and Otherfiles for each profile, then click the SAVE button to commit the relationships. 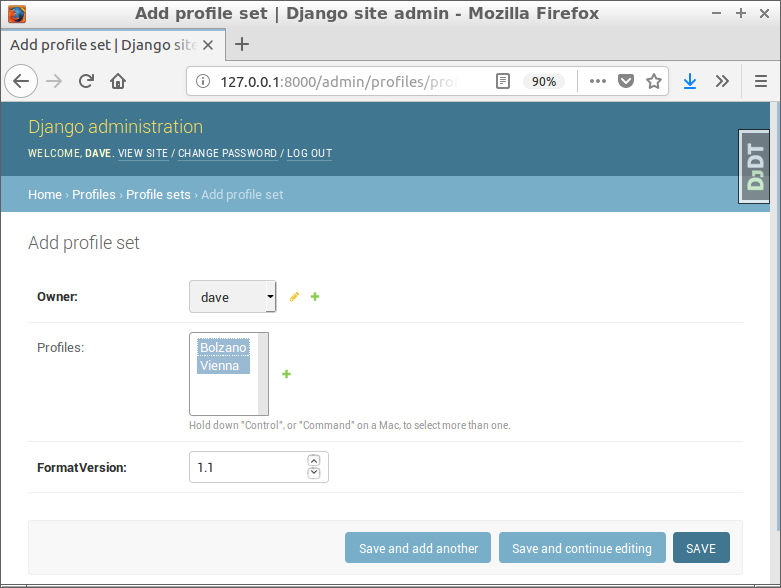 Don’t worry about getting it wrong, these edits can be changed at any time, and it is possible to have multiple profiles referencing the same support files. Follow the same process for the Vienna profile. Now go to http://127.0.0.1:8000/admin/profilesets which is where the user is linked to one or more profiles. Click the ADD PROFILE SET button to get a window as shown, select the user and one or more of the Profiles and click SAVE. If you point your browser at this RESTful url (http://127.0.0.1:8000/myprofiles/) you should see the desired JSON. Return to the main screen and tap the Import (lower left) icon, then tap Cloud Profiles. 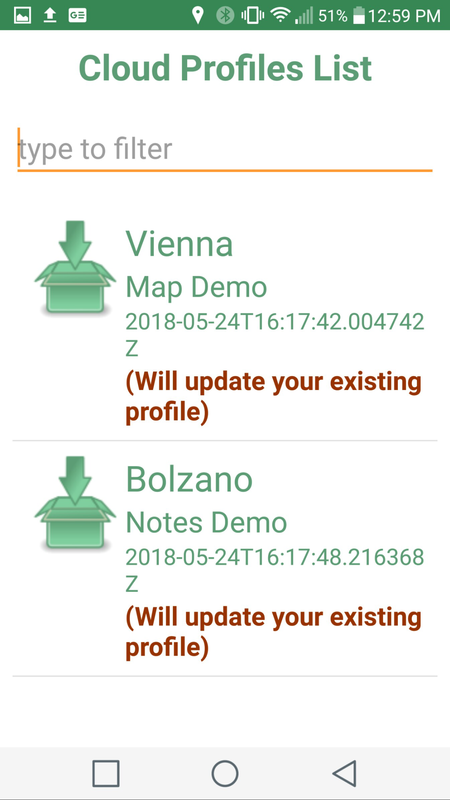 The Vienna and Bolzano profiles should be shown as available for download.